Last week we shared some Pyramid Atlantic workshops, which we love, but realize it may not be convenient for everyone to make it up to Silver Spring for classes. Well, city-dwellers, today is your day! 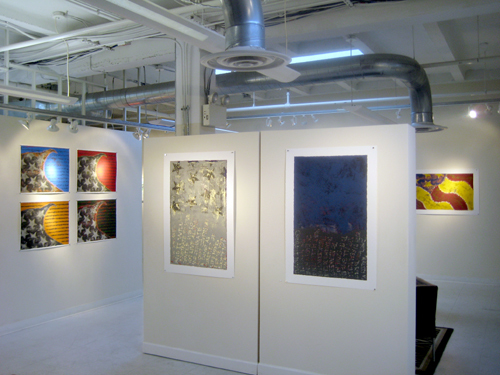 Open Studio DC is offering several courses in screenprinting! 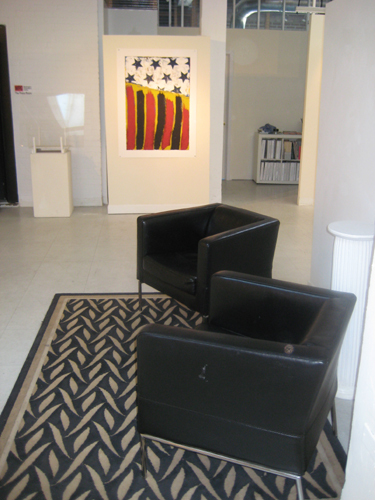 Open Studio DC is located at 1348 Florida Ave, NE (H St Corridor). Founded by Corcoran Professor Carolyn Hartmann, OSDC provides the space and supplies – from high quality inks to a huge exposure unit-that artists need to complete their screenprinting projects. Artists can rent the space in hourly up to yearly chunks. Now, they are also offering classes. There are several workshops set up in August and September. We suggest starting with an Introduction to Screenprinting workshop in August and then trying their brand new Intermediate Workshop -4 color separation. 4 color separation, or CMYK printing, is used to re-create color photographs, very similarly to how pictures in the newspaper are printed. Check out their website for this and more workshop opportunities. If you missed today’s Intro to Tabletop Letterpress, don’t worry! Pyramid has another one on August 11. In addition to these two classes, they also have a “Meet The Press” workshop: Vandercook on July 26 and Tabletop on August 23. In addition to their letterpress classes, Pyramid is also offering some other interesting workshops. We’re fans of their Introduction to Screenprinting on Fabric, since everyone wants to know how to make their own T-shirts (or curtains or throw pillows or hand-towels!). This workshop is Saturday, August 25. The Introduction to Japanese Papermaking workshop on July 28 also looks interesting–so many of our printmakers use Japanese paper for its thin flexibility coupled with its strength. This is just a sampling of the summer courses you can still sign up for. Pyramid’s workshop website has courses through December up now if you’re the plan-ahead type (handmade holiday cards? Yes, please!) Check it out and find a class for your creativity! We’re thinking a lot about serigraphs (aka screenprints or silkscreens) right now as Michael Hagan’s exhibition “Doodle Digit Dot” goes up next week. We’ll have images and more information about his printing process next month (for now, you can check out his blog entry on halftone screenprints to get an idea of his work and process). In this entry we wanted to talk about another WPG artist, Andis Applewhite, and her interesting process of reductive serigraphs, which got a lot of questions during her July solo exhibition. You can best understand the process by watching her videoof the process (click the link to see it). But here’s the basic idea: Andis uses a water-based resist on the screen. A resist blocks the screen, so when the squeegee is pulled over it, the ink will not go through to the paper in area’s that have been painted. Using a water-based resist means Andis can easily manipulate any marks she’s made–picking up areas with a wet sponge or moving the resist around to create a textured background. However, using a water-based resist also means she must use an oil-based ink. Oil based ink can be cleaned off the screen with mineral oi or turpentine (or other similar paint thinners) without affecting the water-based resist. If she used a water-based ink and tried to rinse it off with water, the resist on the screen would come off, too! Andis starts with a large area of color and prints that first. In the video, it looks like she started with a black. Then, she paints the resist on the screen. The black will remain visible in these areas. 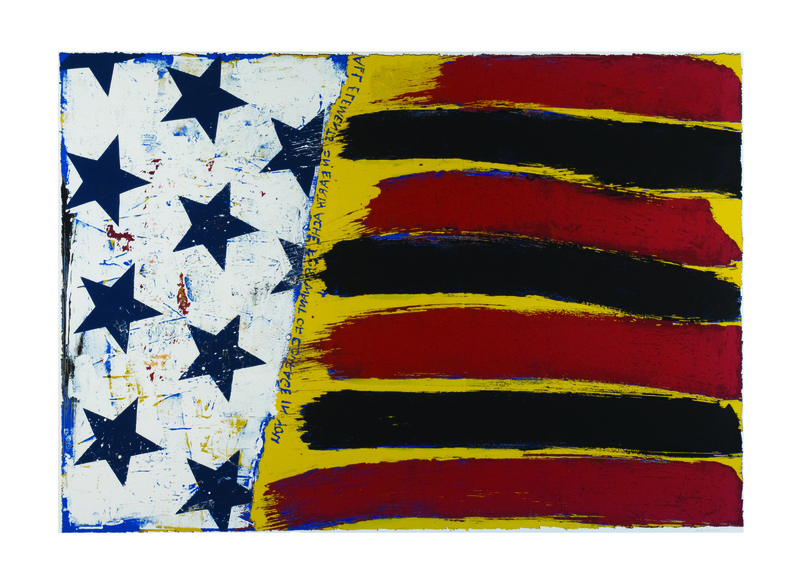 You can see in the video that her second printing of yellow was another large area, with only a few brush-strokes of resist leaving the black from the first layer visible. Finally, in the video, you can see her painting another layer of resist. Anywhere this resist doesn’t cover is then printed white. 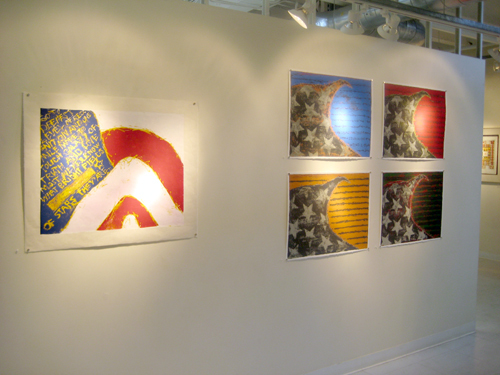 You can see examples of Andis’ reductive serigraphs in the gallery. 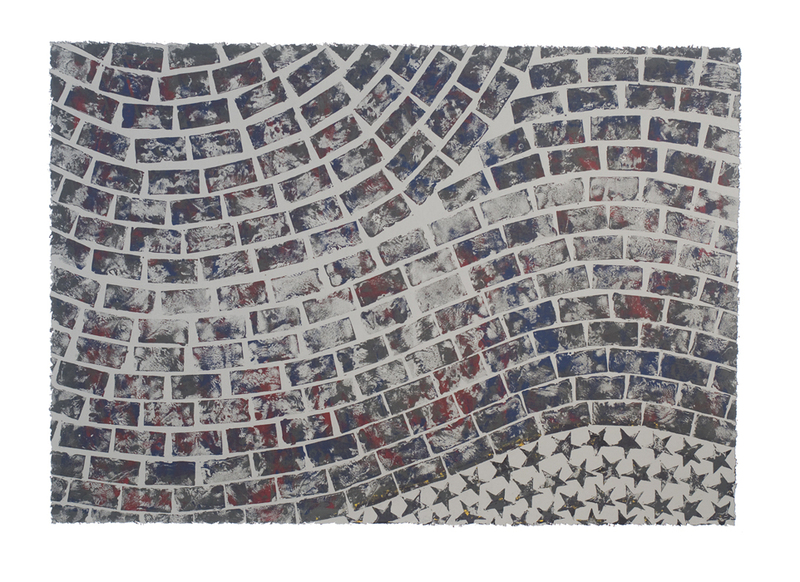 You can also see Michael Hagan’s very different screenprinting process starting next week. Come in and compare the two for yourself! Posted on September 23, 2011 by wpgmembers | Comments Off on Welcome Clare Winslow! WPG is pleased to welcome our newest artist member, Clare Winslow. 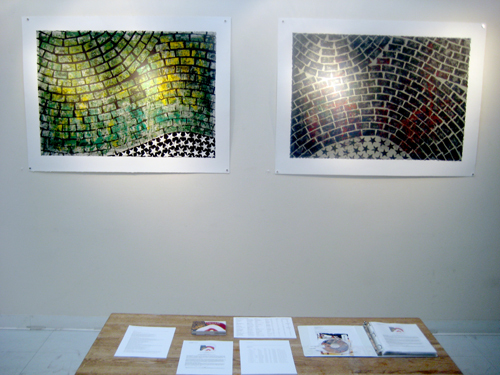 You may remember the print to the left from last year’s National Small Works Exhibition. Clare’s print “Hands Up” below, was also in Pyramid Atlantic’s annual exhibition at WPG this past April. You can see some of Clare’s prints on our website (click on her name, above), or, better yet, come in and see what we have in the gallery! Comments Off on Welcome Clare Winslow! In this week’s Gazette (or in the link below) you can read the review by Claudia Rousseau of Andis Applewhite’s current solo exhibition, Freedom, on view at WPG through July 31. Claudia calls Andis’ work “visually compelling, provocative and intelligent” on both “formal and conceptual levels.” Thanks, Claudia! 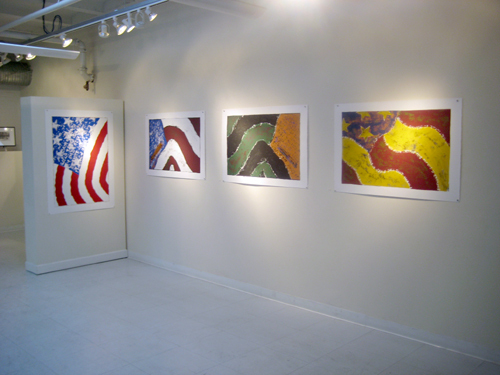 Andis Applewhite’s new solo exhibition, Freedom, is up at the gallery! The official opening is Saturday, July 2 (THIS Saturday!) 1-4 pm and the artist talk is Saturday, July 9, 1-4 pm. If you’re looking for something artsy to do this holiday weekend we suggest this show (we’re open on the 3rd, closed on the 4th) These prints look great in the photos and even better in person, stop by and check it out! A few things we want to share with you as you look forward to summer planning and summer shows! 1. Max-Karl Winkler Artist Demo and Talk–This is TOMORROW, 1-4 pm. 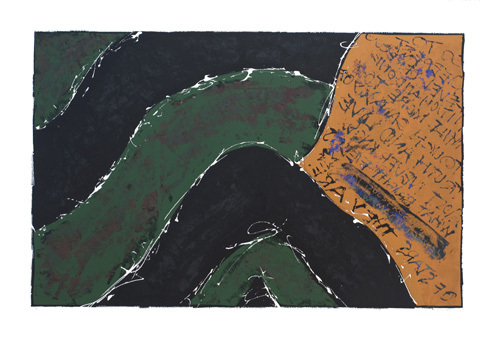 Max will print a woodcut and also talk about the work he has in his current solo exhibition. Demos are always a fun learning experience, we hope to see you there! 2. Will Barnet: 100 Years–now through June 26, Visarts at Rockville hosts an exhibition of privately collected prints by Will Barnet in celebration of his recent 100th birthday. Johns, and Andis looks to continue the conversation he started by asking the question of what freedom really is. This exhibition runs June 29-July 31, with an opening reception on the 2nd and artist talk on the 9th. 3. 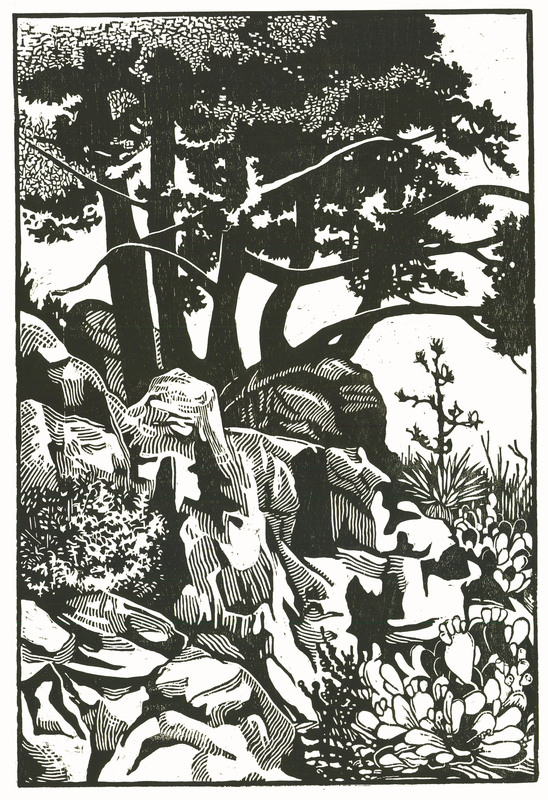 Director’s Cut at the Old Print Gallery–this exhibition, which starts July 15, features woodcuts that have been hand-selected by OPG director Laura Graham. These woodcuts range from the 15th century to contemporary prints.